How are the red rubies made? Peeled and diced water chestnuts are coated with red food colouring, dipped in tapioca flour then boiled in water – the tapioca flour creates a reddish and translucent coating around the water chestnuts, and because of the red food colouring, they look just like red rubies, don’t they? I would have used fresh coconut milk but it’s impossible to get them here. ): I’ve tried using both canned and powdered coconut milk before for this dessert and they work just fine. And if possible, don’t skip the pandan! Infusing the pandan flavour into the coconut milk is just amazing. I brought back a huge bunch of pandan leaves from Singapore when I went back in December, rinsed the leaves and freeze them in small bundles so I can use them whenever I want. I absolutely love how the red rubies are crunchy (water chestnuts) and slightly chewy (tapioca flour coating) at the same time. Served chilled with coconut milk makes this the one of the best dessert to enjoy during summer! If you don’t want to make the pandan-infused coconut milk, why not try having these beautiful red rubies with my no-churn coconut ice cream? Equally yummy I believe! Here’s how to make this delicious Thai dessert! 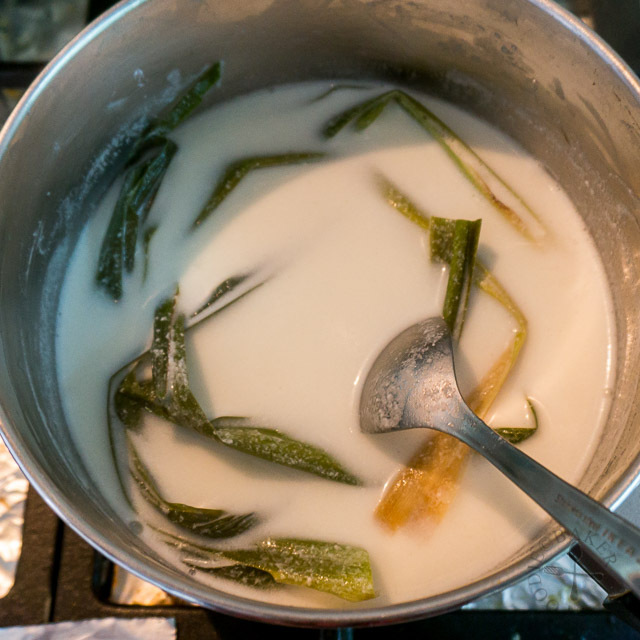 1) Combine coconut milk and pandan leaves in a separate, clean pot and bring to a simmer. Simmer for 10 to 15 minutes to infuse it with the pandan flavour and add in sugar to taste. Remove from heat and set aside to cool completely. Remove the pandan leaves and chill the coconut milk in the refrigerator. 2) Halve each water chestnut horitzontally to form 2 discs, then cut each disc into 6 pieces (12 pieces per chestnut). 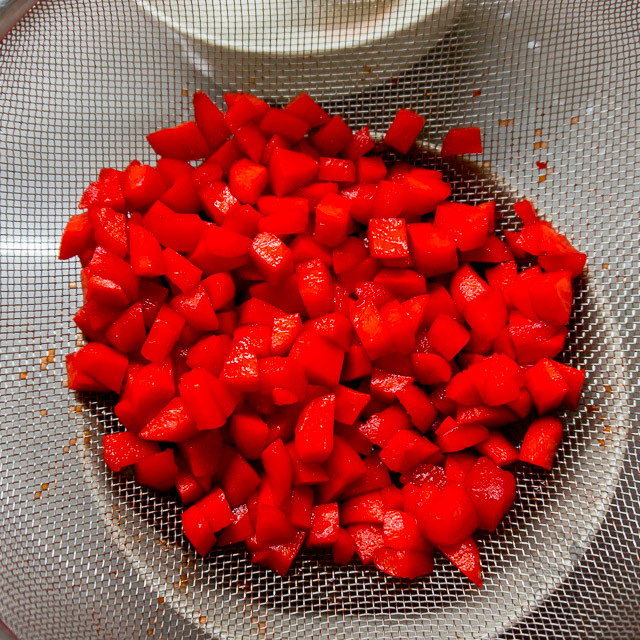 3) Transfer the water chestnut pieces into a bowl and add in 5 drops of red food colouring and 1 tablespoon of water. Stir with a spoon to colour the water chestnuts. If you think it's not red enough, add a few more drops of red food colouring. Set aside for 5 minutes. 4) Place 3/4 cup of tapioca flour in a shallow bowl. Transfer the dyed water chestnuts into a sieve and drain away all the liquid (discard the liquid). 5) Transfer the water chestnuts into a bowl of tapioca flour and toss with a spoon to ensure every piece is coated with tapioca flour. 6) Scoop out all the water chestnuts into the sieve and tap gently to sift out excess tapioca flour. 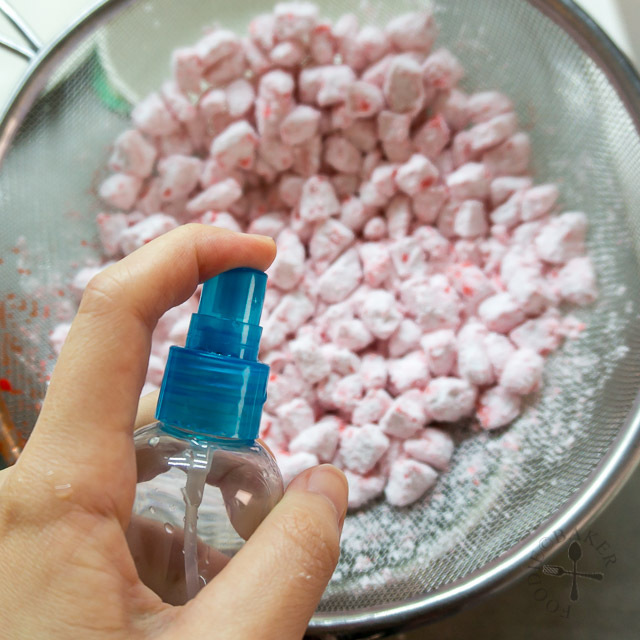 7) Spritz the water chestnuts all over with water, then return the water chestnuts back into the bowl of tapioca flour for a second coating. Transfer into a sieve and sift out excess tapioca flour. 8) Add the water chestnuts into the boiling pot of water (it must be boiling!) and stir for 30 seconds to prevent the water chestnuts from sticking to the bottom of the pot and from sticking to each other. 9) Boil the water chestnuts, stirring occasionally, until they float on the surface of the water, which will take only a few minutes. 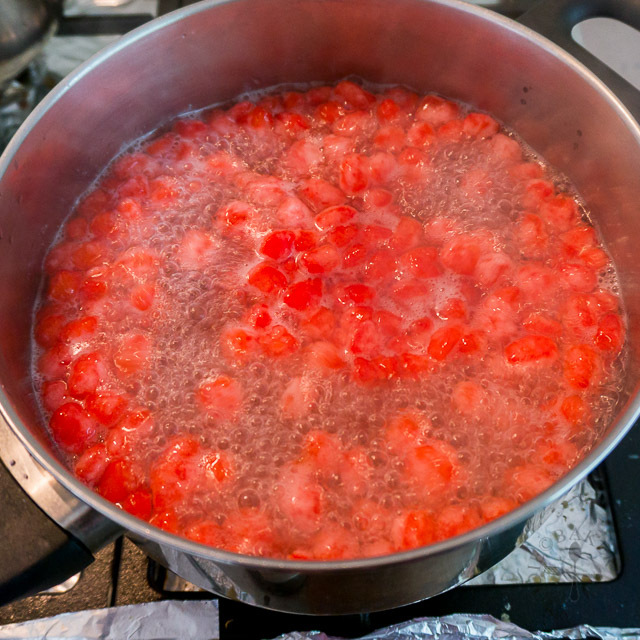 10) Remove the red rubies with a slotted spoon and immediately plunge them in the bowl of ice water to stop the cooking. Combine coconut milk and pandan leaves in a separate, clean pot and bring to a simmer. Simmer for 10 to 15 minutes to infuse it with the pandan flavour and add in sugar to taste. Remove from heat and set aside to cool completely. Remove the pandan leaves and chill the coconut milk in the refrigerator. Combine sugar and water in a small pot. Bring to a simmer and stir until all the sugar has dissolved. Remove from heat and set aside until the syrup has cooled completely to room temperature. Peel the water chestnuts. 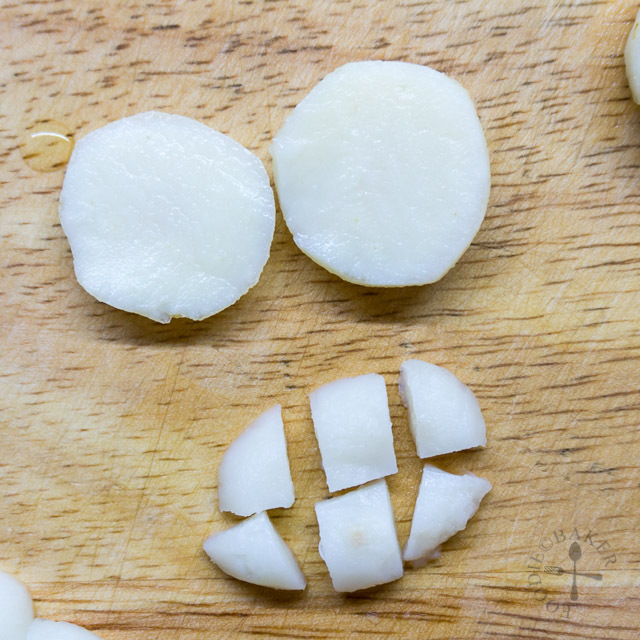 Halve each water chestnut horizontally to form 2 discs, then cut each disc into 6 pieces (12 pieces per chestnut). 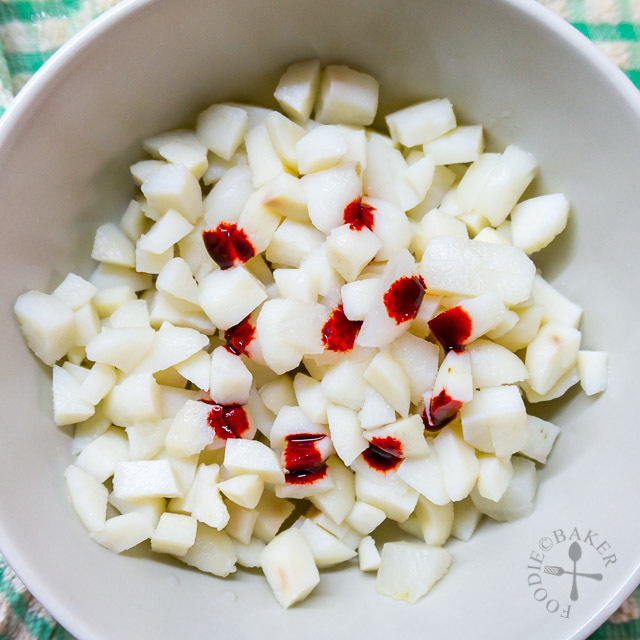 Transfer the water chestnut pieces into a bowl and add in 5 drops of red food colouring and 1 tablespoon of water. Stir with a spoon to colour the water chestnuts. If you think it's not red enough, add a few more drops of red food colouring. Set aside for 5 minutes. Bring a large pot of water to boil. Prepare a large bowl of ice water. Place ¾ cup of tapioca flour in a shallow bowl. Transfer the dyed water chestnuts into a sieve and drain away all the liquid (discard the liquid). Transfer the water chestnuts into the bowl of tapioca flour and toss with a spoon to ensure every piece is coated with tapioca flour. 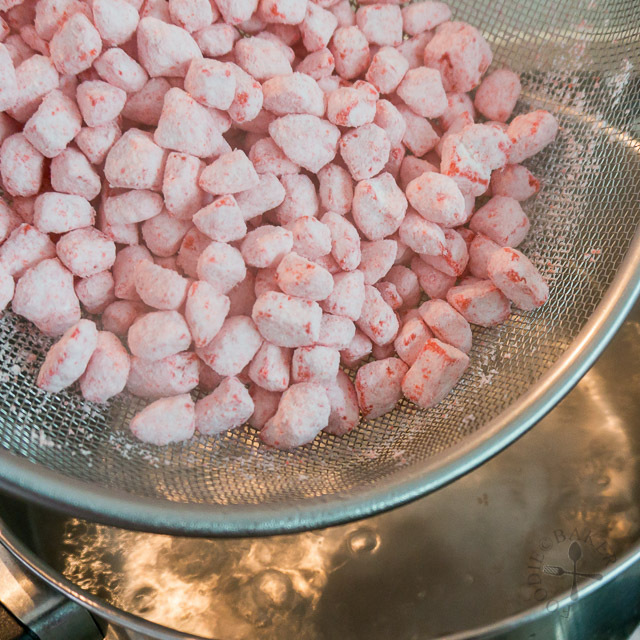 Scoop out all the water chestnuts into the sieve and tap gently to sift out excess tapioca flour. 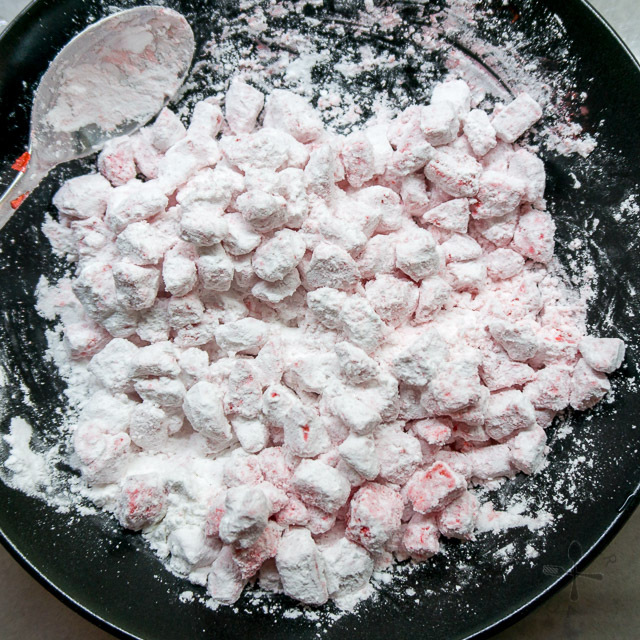 Spritz the water chestnuts all over with water, then return the water chestnuts back into the bowl of tapioca flour. Add in remaining ¼ cup tapioca flour if needed to coat the water chestnuts. 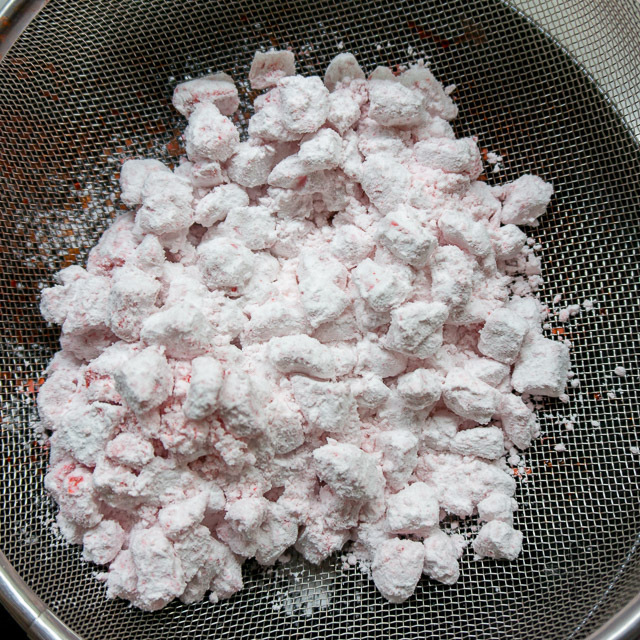 Scoop out the water chestnuts again into the sieve and tap to sift out excess tapioca flour. Add the water chestnuts into the boiling pot of water (it must be boiling!) and stir for 30 seconds to prevent the water chestnuts from sticking to the bottom of the pot and from sticking to each other. Boil the water chestnuts, stirring occasionally, until they float on the surface of the water, which will take only a few minutes. 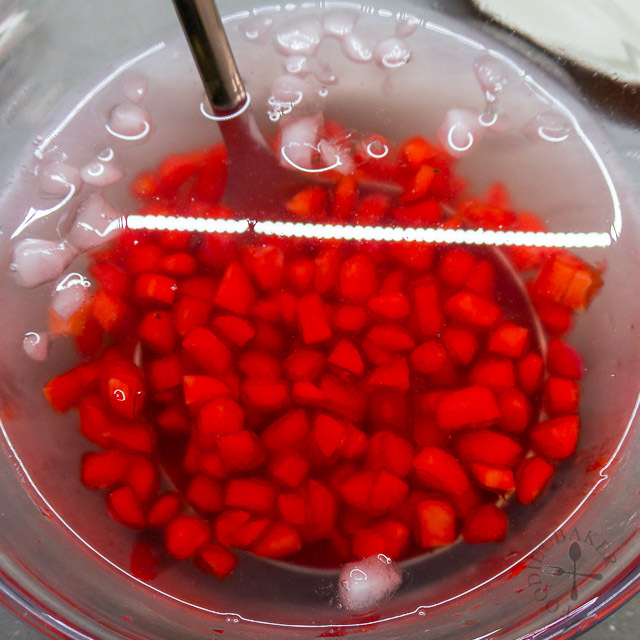 The tapioca flour will form a chewy layer around the water chestnuts and become translucent, forming the red rubies. Remove the red rubies with a slotted spoon and immediately plunge them in the bowl of ice water to stop the cooking. 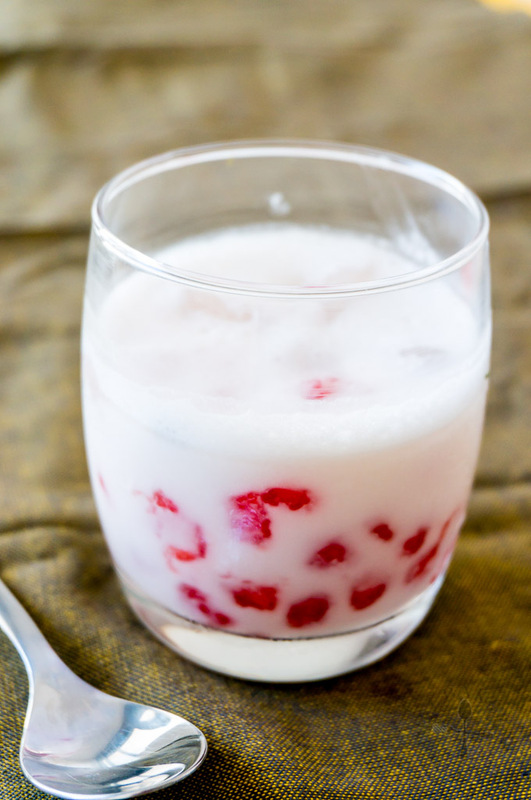 If serving immediately, strain the red rubies and add them into the coconut milk and serve the syrup on the side. If not, strain the red rubies and add them into the syrup. Refrigerate them until ready to serve. Use a slotted spoon to scoop the red rubies into serving cup. Top with the chilled coconut milk and serve. Allow your guests to add in additional syrup (used to soak the red rubies) if desired. 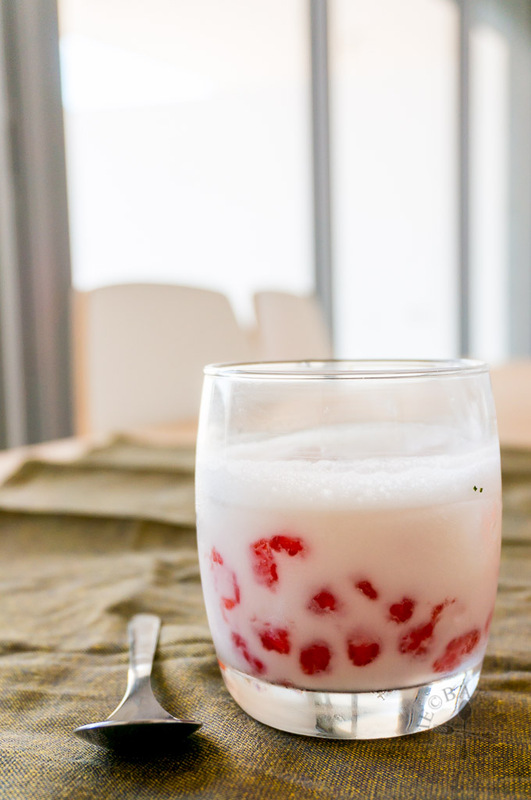 - If you add the red rubies into the coconut milk, serve it as soon as possible because if left aside for too long, the red rubies will dye the coconut milk pink colour. Hi Jasline, Your tub tim grob look so good. I love this refreshing dessert especially with some shave iced. Excellent pictures, very well taken. This is gorgeous and I love having some Asian desserts to switch things up. What a great recipe – so interesting to learn how this is made! Ohhhhh so THIS is how it’s done!! I’ve had this so many times in a similar Vietnamese dessert “che” and the red rubies are my favorite! Thanks for the amazing recipe 🙂 Will DEFINITELY give this a try. they look as delicious as the photo …. slurp!!! Well, that looks very refreshing indeed! I love you decided to use pandan leaves in here! It looks so delish! 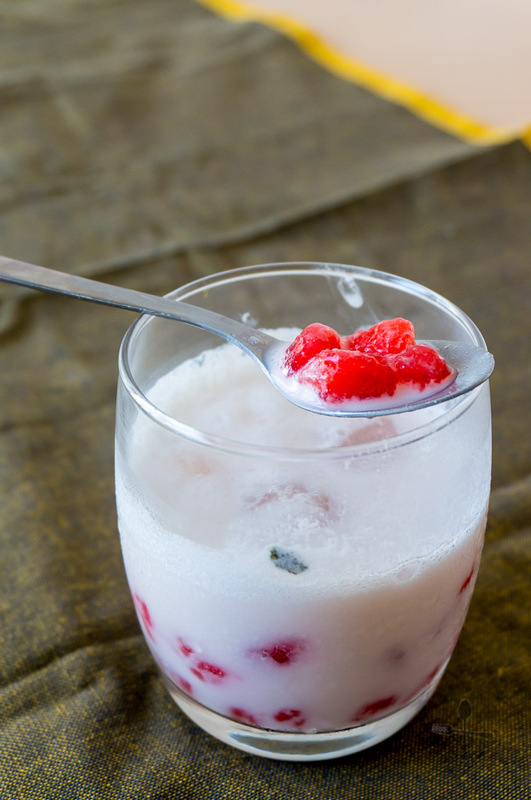 Pretty red rubies … love this refreshing tropical dessert. 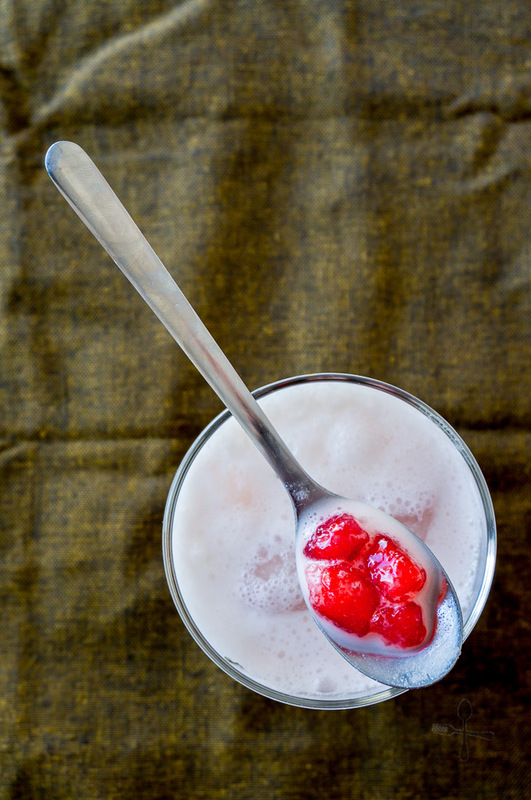 The red ‘rubies’ are so beautiful in the infused coconut milk, Jasline! This is my favourite Thai dessert. Too bad we can’t get fresh water chestnuts over here. Your tub Tim grob looks fantastic! Loving this little recipe. I love anything with fragrant pandan leaves in it. Can you find pandan leaves where you are now? I hope so. Sharing!